Got questions? Give us a call as we’d be happy to help you. We are open from Mondays to Saturdays, 8 am to 8 pm. As Las Vegas locals we know just how hard air duct systems have to work in the extreme desert heat, and yet so many people overlook just how much strain their systems are put under. As one of the most reliable air conditioning companies in Las Vegas, we see it as our mission to keep the air vents of the city clean, and ensure that the air in your home or business premises remains healthy and fresh. We can remove everything from dust, pollen and dust mites to all kinds of other bacteria and debris that has become trapped in your air ducts. 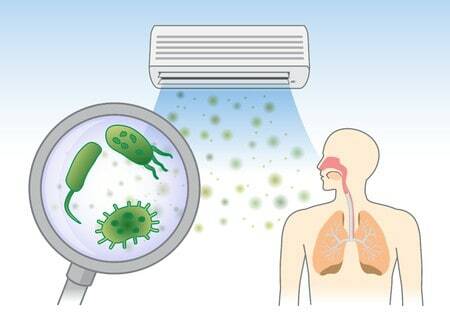 Dirty air conditioning units that haven’t been serviced in a long time become breeding grounds for all kinds of harmful bacteria. This bacteria can, over time, lead to health problems such as breathing difficulties, fevers and/or headaches. To ensure your health and that of your family’s, we take our job very seriously. We don’t cut any corners and we’re very meticulous so you can rest assured that your unit(s) will get a thorough clean when you choose Spotless Ducts. Call us now on (702) 819-7734 to discuss your duct cleaning needs. We’re open from Monday to Saturday, 8:00am to 8:00pm, and are happy to answer all your questions. We’re known throughout the Valley area for providing a prompt and efficient service. We clean every part of your building’s air duct system, from the air handling unit components, outdoor air intakes and reheat coils to the supply, return and exhaust of the ductwork. In this way you know you’ll be getting a thorough clean, and we’ll even provide you with before and after photos of your ducts to prove it. Check out our homepage for some before and after pictures. We understand that cleaning out your air ducts is probably not your priority, and it’s a job that’s often overlooked. As a professional air duct cleaning company, we take care of air duct systems in both residential and commercial properties, together with the vents in residential dryers. We not only remove all the dust and debris that’s been caught up in your vents and ducts, but we also carry out a thorough sanitizing process to eliminate any bacteria or unwanted organisms. We have experience in cleaning and sanitizing all kinds of HVAC systems, and we plan every job to ensure that there’s the minimum amount of downtime for your system.